Those are the words you will here when you visit our shop. Remember those items from your youth that bring a warm feeling? It was that vacation you took with your family to a cabin in the woods, on a lake or that trip to the beach. Remember the smell of cedar, the details of the woodwork, the feel of each room? These are the feelings we strive to reproduce in each piece we make. We are blessed with a company that reflects what we do for fun. So take a look around and have fun. Some of our pages open a bit slow. to show you what you are looking at. We are as proud of our work as you are of the items you bring into your home. than a speedy thumbnail image that you can't see. So please grab a seat, your favorite beverage and prepare to become our next customer. My sister and I bought one of your outdoor nativity scenes back in December. It was a Christmas gift for my mom, and I just wanted to let you know that she loved it. My siblings and I decided to paint it for her, and I thought you might like to see how it turned out, so here's a few photos. 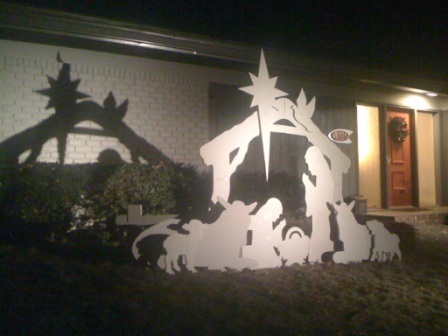 The painting your family did on your Nativity Scene is amazing. I am constantly thrilled to find the level of artistic talent that is hidden until it becomes inspired. Thank you so much for sharing your passion and talent with me. I have shown those pictures to so many people and they all have been touched by your attention to detail. "God Bless you all and have a wonderful Merry Christmas and Happy New Year. We love our Nativity thank you so much"
We received the Nativity Scene and love it! The quality is top notch. Thanks so much. Happy Holidays! Many of our customers prefer the unpainted versions of our nativity sets. They prefer to add their own creativity and some of them are highly detailed with detailed faces and shading on the palm trees. On the central Nativity (scene #2) I've been told by some that they stained the stable and fences and used silver or gold glitter on the star. Lambs and donkeys can be staked to ground to create a larger scene. "Painted scene same dove gray as house - highlighted star, dove, & halo with a little silver. Wifey says It's subtle & beautiful! All the Best & Merry Christmas to you!" "Thank you so much, they are perfect. You do beautiful work. Have a blessed season." 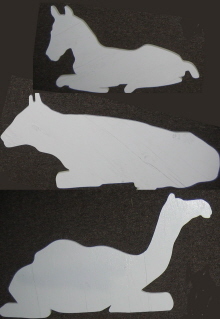 Camel 36" x 18 1/2"
Candle flame is 3 1/2" behind candle, supported by a shelf. This allows you to mount a light on the shelf making the flame glow or flicker.